Whether it's a wedding, a once-in-a-lifetime anniversary party, or an important business meeting, private events share one thing in common: there is no room for error. We will go above and beyond to create flawless events that perfectly suits the needs of our members and guests. Let us show you how we can take your breath away with the rare and classical ambiance of our club, flawless attention to detail, exquisite cuisine and personalized service. Located on the second floor our dramatic Grand Ballroom is an exceptional choice for both social occasions and business functions. 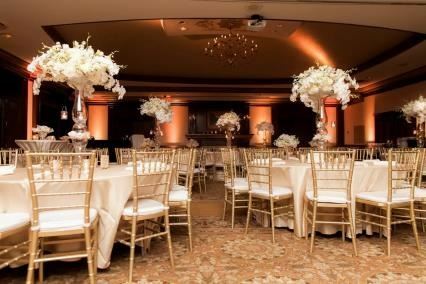 You can utilize our entire ballroom of 4200 square feet or we can close the walls and make it into 3 separate rooms. The walls are paneled in an exquisite birch wood and the terrace just off of the ballroom is perfect for your buffet. Across the hall from the Dining Room on the second floor, The Lounge creates a gracious atmosphere for business meetings and cozy celebrations. Natural light sets off the wood paneling and art deco chandeliers. True to its name, the room features a built in bar for an old world bar service.